The garden hosts an array of creatures, some seemingly primitive, some rather magical. Which is which? The beholder gets to choose. First up, this well-camouflaged mantis was actually upside down when we met. When I checked on him a few minutes later he had climbed up and was walking along the top back of a bench on the front porch. 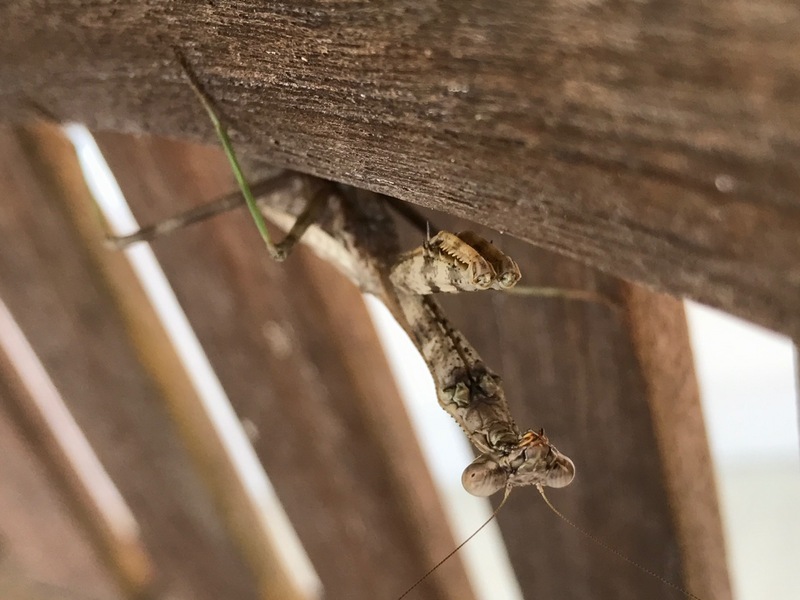 This 40-second video gives you some idea of how the mantis stealthily moved along, wary that I was watching him. 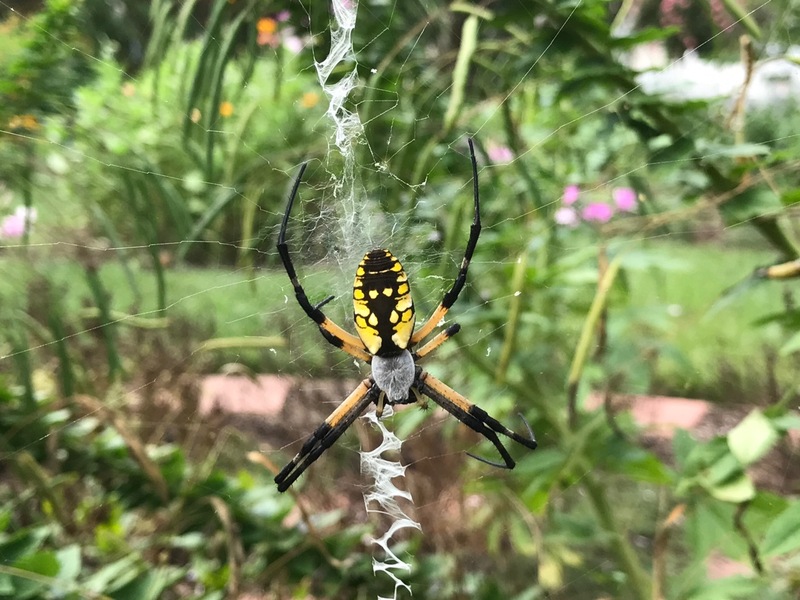 Each year I stumble across one of these spiders and am eternally grateful I did not stumble into the web. 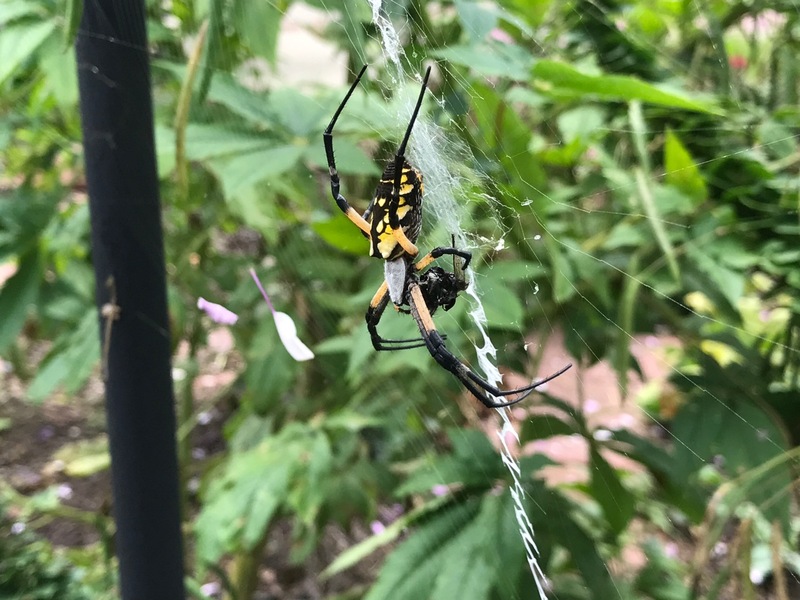 This yellow garden spider (also known as writing spider) was camped out in the center of the meditation circle on August 9, 2017. A few days later she was gone. Bees are also partial to Echinacea (Purple Coneflower). 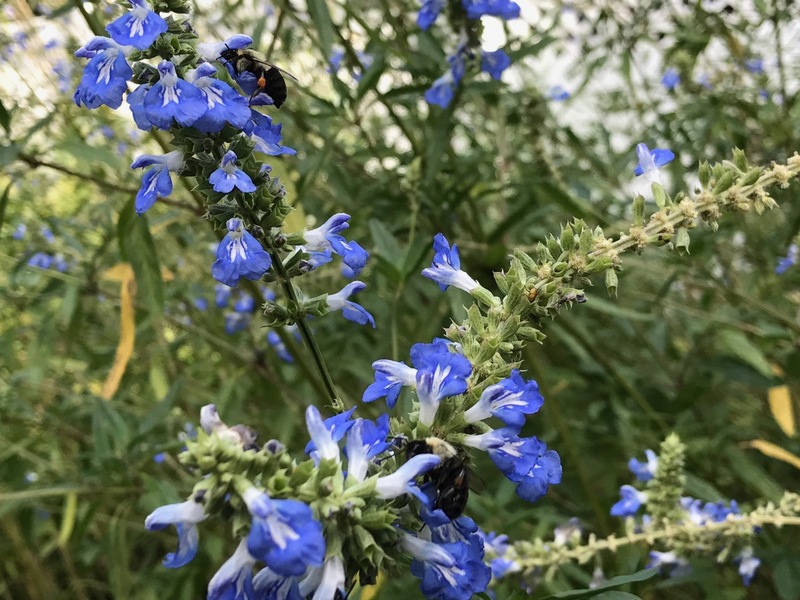 Not that I can identify them but my home state of North Carolina has more than 500 native bee species. 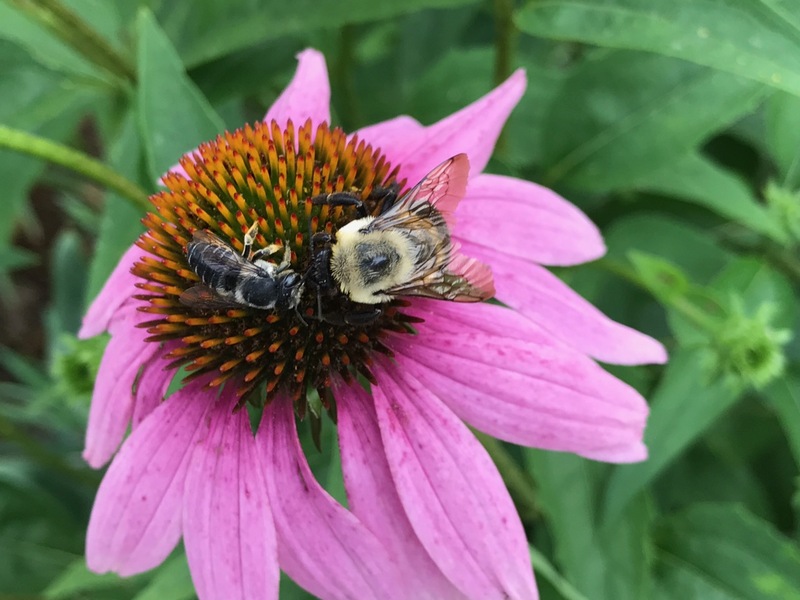 Turn up the sound for this video of bees and coneflower and you also will hear a few of the garden’s birds in the background. I included a 3-second video of this bee mainly to share the white swan coneflower, which really has been beautiful this season. 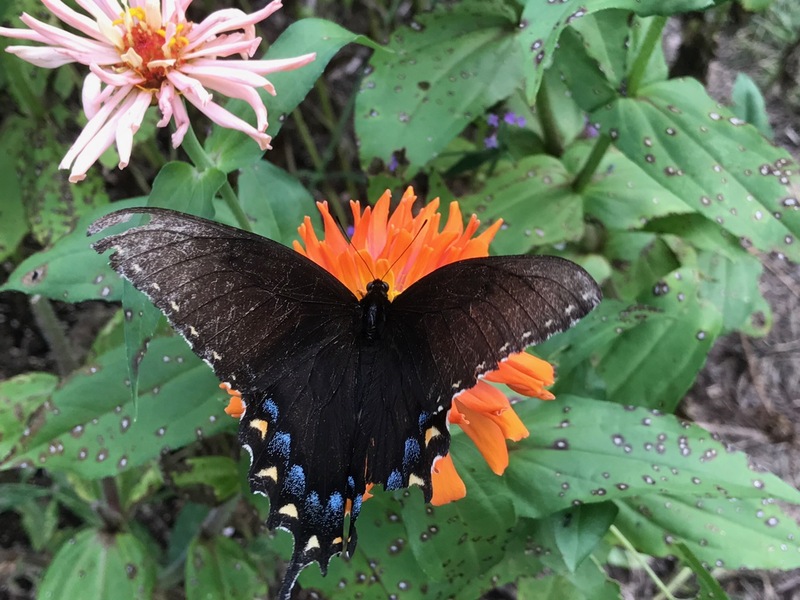 At the southern entrance to the garden a towering Rudbeckia laciniata (Green-Headed Coneflower) hosts a multitude of insects including this unknown Lepidoptera. You may remember this guy from a few days ago. I misidentified it as Eastern Cicada Killer but it is Milesia virginiensis (Virginia Flower Fly). Just wanted to set the record straight. Time to wrap this up. I will close with a tattered butterfly nectaring on zinnias. The zinnia foliage has become rather tattered and scarred, although fresh flowers continue to form. I think this is a female Eastern Tiger Swallowtail (Papilio glaucus). 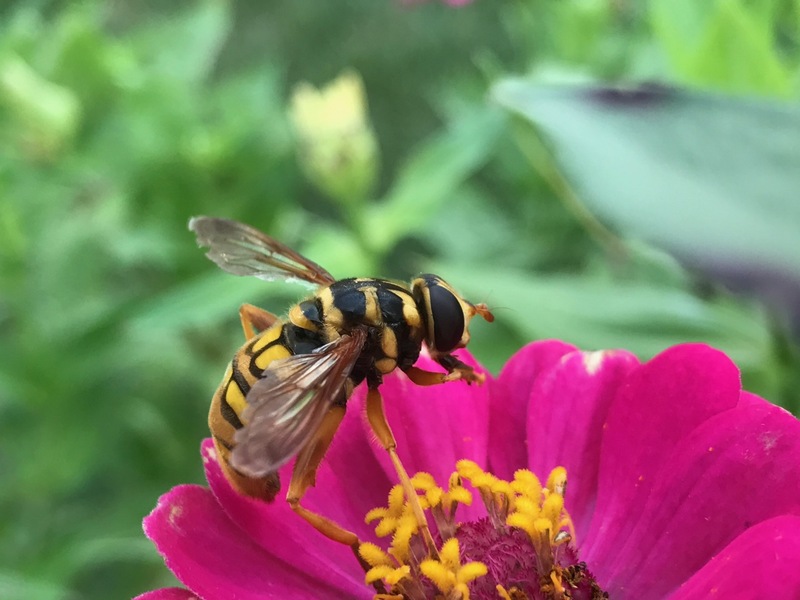 This entry was posted in garden on September 7, 2017 by pbmgarden. Some strange, but all wonderful and amazing! Lovely photos and videos Susie. 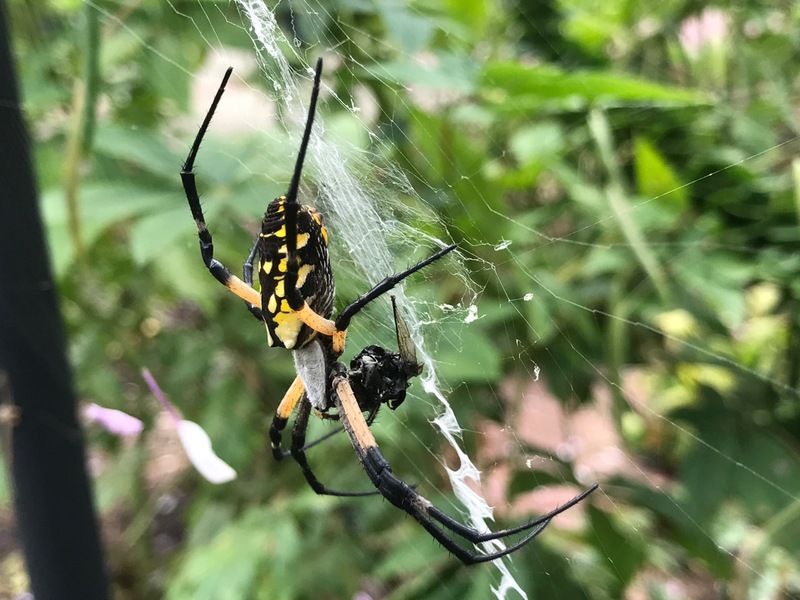 I haven’t seen anything unusual innoirbgarden this year, but will be looking out for the yellow garden spiders which show up best in autumn. I did see a very large grasshopper recently, that surprised me by taking a giant hop and then flying away! Grasshoppers are strangely built creatures too. I know that feeling of surprise when they jump suddenly! Have a good day Cathy! It is great when you can capture these creatures on camera. Bugs would be interesting to study, if they weren’t so creepy. Actually, I am doing better with them as I realize most are not dangerous. I appreciate bugs and insects more when I’ve discovered them in the garden and taken time to look them up (but only up to a point!). I haven’t seen a praying mantis in years, and I have never seen a brown one. Ours a green. The spider and the fly…creepy. Hi Lisa, I don’t see many mantises either. 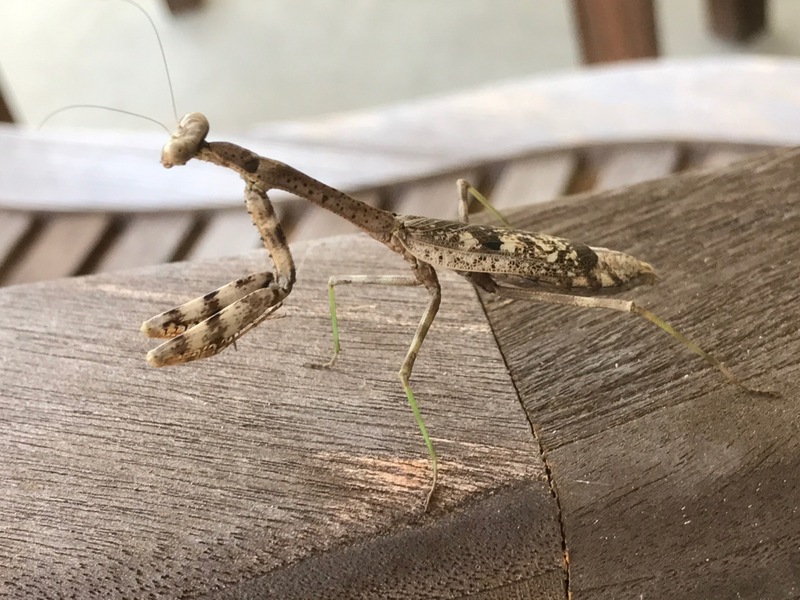 This Carolina mantis can be dusty brown, gray, or green. I read these can adapt to their environment when, as nymphs, they may change color during molting (apparently they don’t change after adulthood). Great captures Susie. Our preying mantis are usually bright green but last week I saw a brown one very similar in colour to yours. Thanks Christina. 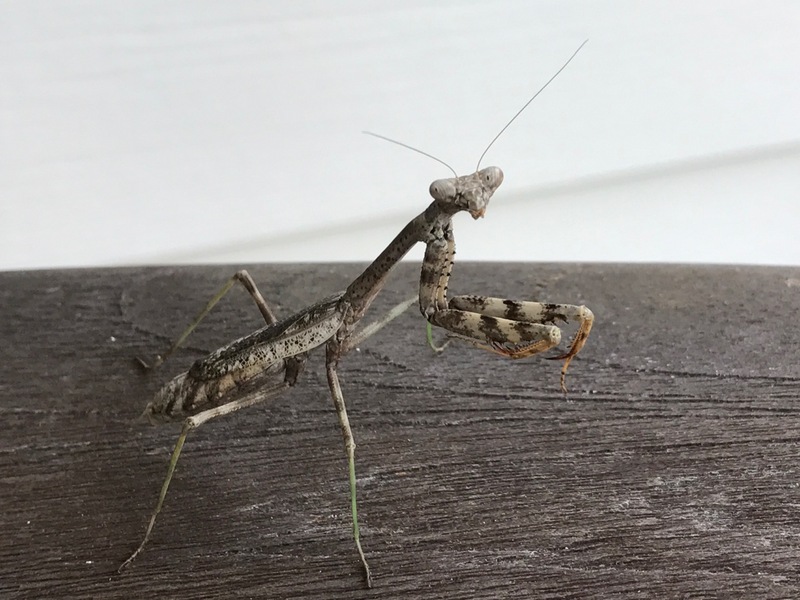 The Carolina mantis can be dusty brown, gray, or green. I read these can adapt to their environment when, as nymphs, they may change color during molting (apparently they don’t change after adulthood). I loved every bit of this. I will be looking at it again. 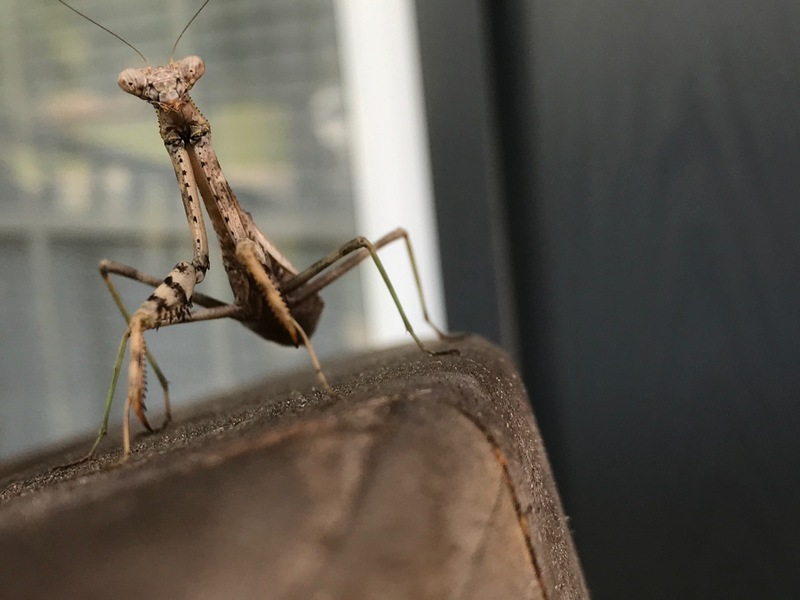 I have mantis and spider friends that I check on every day. Thank you very much. You’re more in tune with the creatures of your garden. All are handsome creatures! 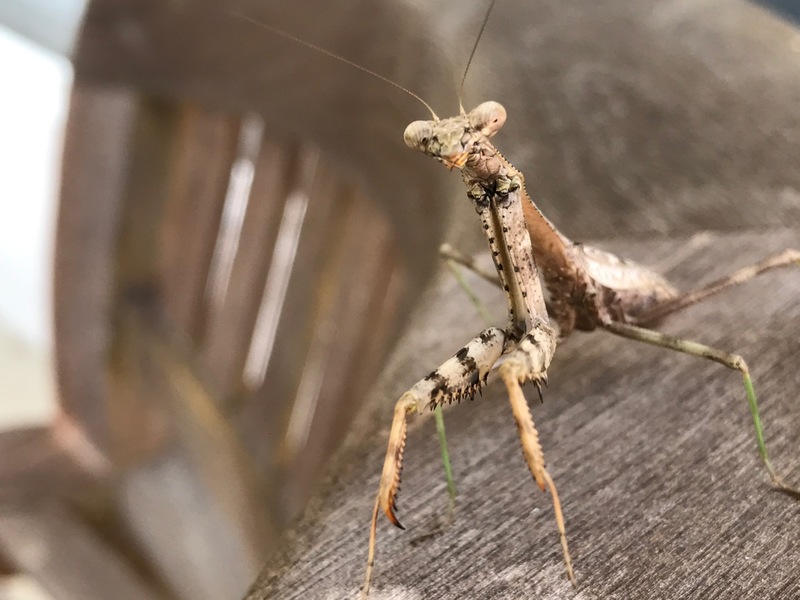 Sadly, I haven’t seen a single praying mantis this year. I’ve lots of spiders, though – and ants, which appear to want to move inside. Ditto with the lizards. This was my first mantis this year Kris. We had a lot of trouble with ants invading the house early in spring but no problem lately. Lizards would probably test my open mindedness! Great camouflage on the mantis. I have only seen green ones, but then green is the dominant color around here. I usually think of them as green but this one certainly chose the right color for our front porch. Probably more things out there I don’t even want to know about! Must be mantis season! I love that you’ve included videos, too. A nice thing to look at in winter when all is dormant. I really should have a video camera! I updated my iPhone last year and have enjoyed the cameras and the video feature. But it’s difficult to get interesting footage, so I need to work on learning to edit better. Great post! The first few photos had me thinking about Monarch eggs and caterpillars, since those are some of their predators. Every creature has its place, though. Beautiful photos and explanations! Oh, poor little Monarchs. I read people buy these at garden centers to eat aphids in their gardens. Why am I ok with them eating aphids, but I feel differently about monarchs–oh well. It would be lovely to see praying mantis here in the UK, because there is something endlessly fascinating about them. I like the green ‘socks’ on yours. (It seems a bit rebellious.) I enjoyed the videos. They’d be good to have as background entertainment in the house. I like those rebellious green socks too! Glad you enjoyed the videos. I’m fairly new at posting videos and hope to work on my editing skills. Some interesting insects and beautiful flowers Susie. Enjoying and observing wildlife adds another dimension to a garden. Thanks Brian. Except for butterflies I never paid attention to wildlife until I started spending time in a garden. Rewarding pastime. Beautiful series of photographs – thanks for sharing. The mantis is a weird looking thing, isn’t it? I did an embroidery of one a couple of years ago, though, and they are very easy to do as they have such distinctive shapes.